A simple Frittata made by Brian using cooked potatoes, smoked salmon, mushrooms, courgettes – infinitely variable to suit what you have in the house and what you like to eat. We didn’t put any cheese in this one, though they are very good with crumbled fetta cheese and dill – might make another one tonight come to think of it. Use a pan that you can put in the oven. This is a cast iron one about 10 inches across. Heat the oven to 180 C about Gas Mark 4. …Chop onions, garlic and courgettes and cook for a few minutes on a low heat till soft but not coloured in a little vegetable oil in your pan. Tip the cooked veggies, uncooked veggies, salmon bits etc into the egg mixture and mix in gently. Return to the hob and cook on a low heat without messing about with it so that the bottom is set and the top still wet and eggy looking. Then pop it in the oven to finish cooking. Some people put them under the grill which might be easier and give a browner top. Remember to use oven gloves to take this out and move it about! You want to leave the middle just a touch runny as it will carry on cooking after you take it out. If you are very anxious about eggs then cook it till you are happy of course. What do you put in your Frittata? This entry was posted in Supper Dishes and tagged cast iron pans, eggs, frittata, vegetables on 26/10/2012 by Joanna. 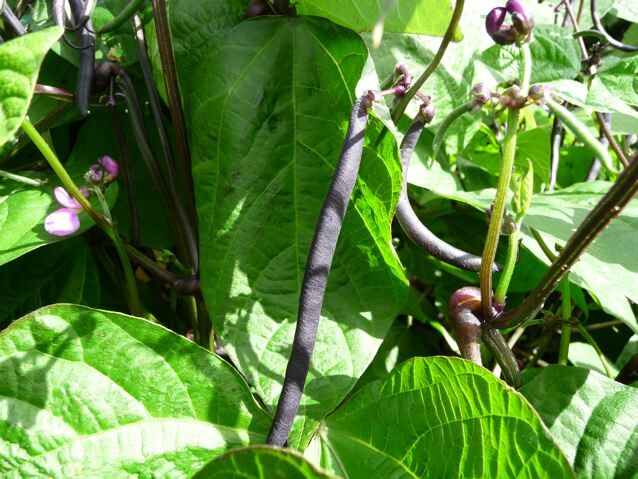 Purple Dwarf Beans and More.. This is my favourite of all the veggies that we grow in our little veg bed. I pick them every day once they start cropping and after three days we have enough to have a good portion of them with a meal. The beans hide under the leaves and you really have to check carefully that you haven’t missed one. Plus they grow really fast once they start going. This entry was posted in Garden, Pure Joy and tagged garden pictures, pear in fruit, vegetables on 17/07/2010 by Joanna.